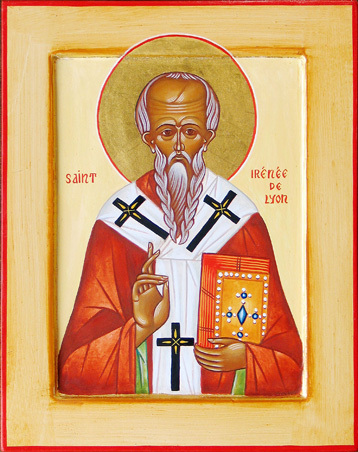 Today is the feast day of St. Irenaeus of Lyons the second century Bishop, Father and Doctor of the Church, and tireless defender of the faith. He was a student of the great St. Polycarp who was a disciple of the apostle John. Irenaeus was first and foremost a man of faith and a Pastor. Like a good Pastor, he had a good sense of proportion, a wealth of doctrine, and missionary enthusiasm. As a writer, he pursued a twofold aim: to defend true doctrine from the attacks of heretics, and to explain the truth of the faith clearly. His two extant works – the five books of The Detection and Overthrow of the False Gnosis and Demonstration of the Apostolic Teaching (which can also be called the oldest “catechism of Christian doctrine”) – exactly corresponded with these aims. In short, Irenaeus can be defined as the champion in the fight against heresies. The second-century Church was threatened by the so-called Gnosis, a doctrine which affirmed that the faith taught in the Church was merely a symbolism for the simple who were unable to grasp difficult concepts; instead, the initiates, the intellectuals – Gnostics, they were called – claimed to understand what was behind these symbols and thus formed an elitist and intellectualist Christianity. Obviously, this intellectual Christianity became increasingly fragmented, splitting into different currents with ideas that were often bizarre and extravagant, yet attractive to many. One element these different currents had in common was “dualism”: they denied faith in the one God and Father of all, Creator and Saviour of man and of the world. To explain evil in the world, they affirmed the existence, besides the Good God, of a negative principle. This negative principle was supposed to have produced material things, matter.Read more here. You can read some of St. Irenaeus writings at the Crossroads Initiative. This entry was posted in Catholic, Early Church, Saints and tagged Catholic feast days, Doctors of the Church, Fathers, St. Irenaeus. Bookmark the permalink.